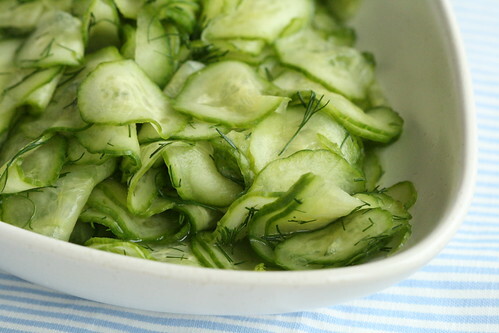 Here's a simple Estonian cucumber salad that my mum used to make quite frequently when we were younger. We never knew there was a 'recipe' involved - just a technology - but recently more detailed instructions have appeared here and there, most notably in a rather elaborate cookbook Eesti Rahvusköök or "Estonian national cuisine", also available in English and German. So why not share it with my English readers as well. What's special about this salad, you may wonder? Well, although I love the crispiness of a fresh cucumber, sometimes I don't miss that in a salad. By mixing the cucumber slices with salt first, and then shaking the mixture vigorously, the cucumber slices soften nicely, and become almost silky in texture. Note that caraway seeds are optional. I love them in this salad, but many people outside the region are suspicious of caraway seeds, so these can be omitted. I make mine without caraway seeds sometimes as well. And if I don't feel like, I don't add vinegar either. It's still delicious and makes a nice side dish to grilled and barbequed meat and fish. Rinse and peel the cucumber, cut into thin slices (ca 3 mm, so not paper-thin). Place in a bowl with a lid, season with salt and caraway seeds. Mix to distribute these evenly and leave to stand for 10 minutes. Now cover the bowl with a lid, and shake the bowl vigorously for 30-60 seconds. This will soften the cucumber slices. Drain, discarding the cucumber 'juice'. Season with vinegar (the salad should taste very subtly acidic), scatter the dill on top and serve. Am going to have to try this, most definitely WITH the caraway seeds. Can't sense the flavour or texture. So yes, will be trying this "recipe" during the week. Thanks for posting. It sounds delightful - and like something to have for brunch this morning! Wow -- I've never heard of this technique before. It really speeds up the salting of the cucumber and helps to get rid of the excess liquid. And it's good exercise, too! That's how I love it too! My sister lived in Latvia for a couple years, so I know she'd love this! I'm glad I found this recipe. I make the same thing without the caraway seeds, can't wait to try it with. That is a very nice summer salad. My grandmother used to make something very similar when I was little. I love the idea of shaking the cucumbers, Pille. 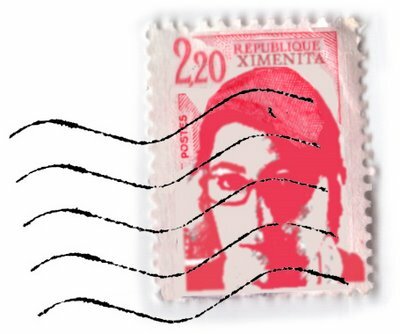 I always learn the most interesting things when I visit your scrumptious blog - and I'm so sorry I wasn't able to meet you while you were in Missouri! Perfect recipe for the summer! "silky texture." That sounds perfect. We make this at home every Summer, I loved your comment on recipe-vs-technology (very nice!). Gotta try this as well (haven't tried the oat flummery, as Barcelona is way to hot for that at the moment...but I'll definitely try it as the weather cools down). Very similar to the one I grew up with - although my mother always added chives. I sometimes add a bit of yogurt to it, as well. Now I have to try it with the caraway... I think the flavors would be yummy! 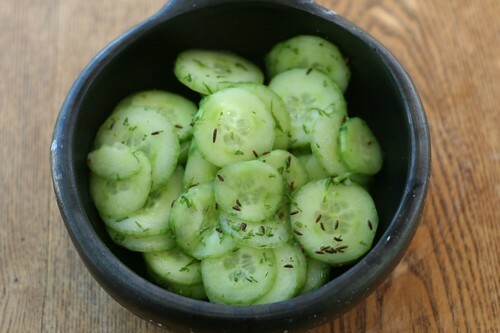 My grandmother used to make these - without the caraway seeds - and called them "vanhanajan kurkut" which translates to "cucumbers from the old times". I love them and make them often myself. I saw the salad on Ibán's flickr pics. I love caraway and tested it today, with fresh homemade bread it's delicous!